Confused about different spiritual myths? What are the "Sacred Cows" of the Christian life? Why are they there? And should they be challenged? What is a 'Sacred Cow'....? Gilpin describes a Sacred Cow as "a universally accepted truth, with no arguments or disagreements". This is where Giplin tries to go against these truths and help you become a stronger person and turn you into a champion of Jesus. In Sacred Cows Make Great BBQs, Dave Gilpin attempts to round up some the sacred cows so happily grazing in the fields of church life, and confront them in his unique, relaxed and informal, yet incisive style. Sacred Cows Make Great BBQs is a penetrating and fresh read, which stands alone as a unique outlook on some beliefs and Christianity as a whole. Fifteen myths so prevalent in the Christian world today are dealt with in Sacred Cows Make Great BBQs, in an elegant and real way. Dave Gilpin sets out to release people back into the real freedom and successes of authentic Christian living. 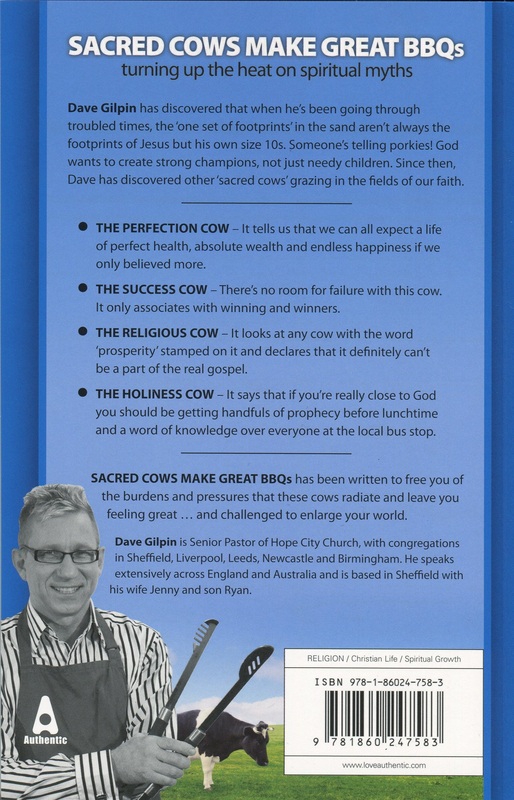 For the sake of the future church, in Sacred Cows Make Great BBQs Dave Gilpin has become the smiling assassin of the holy cow. Not like any other book before it, Sacred Cows Make Great BBQs is a voice that has been waiting to speak for a long time and Gilpin expresses himself as true and real as any other author has done. Dave Gilpin is an eccentric and exciting personality and true Christian in the 21st Century, being described by Author Stuart Bell as a 'breathe of fresh air and highly gifted'. Born on the Wirral in England but raised in Australia from the age of 5, Gilpin eventually moved back to England to Pastor Hope City Church in Sheffield. Gilpin is the Executive Director of the Hope City Enterprise, helping women with addictions, depression, eating disorders and self-harm. He is an exceptional character, producing many fantastic reads including 'The Mind Map Series' and 'ADHA - Attention Deficit Hyperactivity Asset'. The latest instalment in the form of Sacred Cows Make Great BBQs is regarded as his best material to date, allowing people to find answers to questions many people will have. Sacred Cows Make Great BBQs is intelligent and a must read. 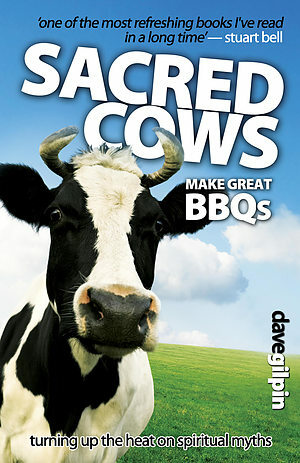 Sacred Cows Make Great BBQs by Dave Gilpin was published by Authentic in November 2009 and is our 13356th best seller. The ISBN for Sacred Cows Make Great BBQs is 9781860247583. Stick a Cow on the bbq - I'm bringing a plate and ketchup! Reviewed by Emma, warming up the charcoal ready for a feast of cow! This book is amazing. Dave Gilpin manages to challenge you whilst being hilarious at the same time. This book is a must read. Half way through and looking forward to sitting down and reading the rest. A book that makes you chuckle and challenges you too! Pure genius. I read this book after it was recommended by a friend. Whilst it made me laugh, it challenged my way of thinking, and took some of the pressure off. Dave Gilpin writes in a way which is easy to read, and understand. Reviewed by Richard, enjoying those sacred bbqs! You know the thoughts you have had about things you see and hear in church, you also know that it feels a bit wrong to have those thoughts. No longer! Dave Gilpin has a great way of explaining things that your brain knew about but hadn't told you yet in a way you understood. If you want to learn about the real Christian life and have fun doing it, buy this book! Suits mainly someone in leadership in a big corporate Church. Lots of stuff on how to sack paid workers and change songs regularly. Starts off really well with some gems but the latter chapters are a bit of a rant. Take a peek at some articles related to Sacred Cows Make Great BBQs. What Do Sacred Cows and BBQs Have in Common? Got a question? No problem! Just click here to ask us about Sacred Cows Make Great BBQs.